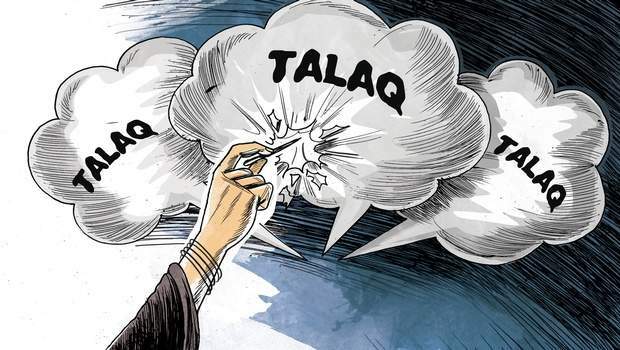 ­Triple talaq is a common practice among Muslim Indians, wherein the man can say the word talaq (the Arabic word for divorce) three times to divorce his wife legally and permanently. It is a way in which women can be subjugated, where their opinions in whether the marriage was over or not mean so little to the men they were married to, had children with, and had built homes with. At first glance, the triple talaq practice is a fundamental violation of a right to equality, and a reification of a patriarchy that is insidious and ever persisting. To understand the practice, however, is to delve deep into its long complicated history – a history that does not operate simply in the marriage and its dynamics, but in its social and political implications, and the inputs that come in from the government, the Muslim community, and other players in the game. On 22 August 2017, the Supreme Court of India declared the practice to be unconstitutional. It was big win for social justice movements who had rallied behind Muslim women. But all reactions to the verdict have not been positive. The decision itself was a divided one, as two judges on the 5 judge panel voted to allow the continuance of triple talaq. Modern Indian Muslims follow Shariat Law, a partial adaptation of the Sharia into the Indian context. Shariat law has been mostly unchanged since it was devised by the Muslim League during the National Movement in the 1940s. At this time, when they were forwarding the Muslim cause to the British who had finally lost their will to continue dominating the subcontinent they had colonized hundreds of years ago. There were confusions as to which laws were to apply to Muslim Indians, and the League wanted their Muslim-ness to define them. The All India Muslim Personal Law Board was very against the ruling that declared triple talaq to be unconstitutional, but it is the same board that has often issued notices and warnings on proper usage of triple talaq. The Board believes in reevaluation, trial separation periods, spacing of time between the declaration of each of the three “talaq”s that constitute the divorce, careful conversations with families, and provision of child support as well as alimony for a certain period of time. It is evident that there is no patriarchal foundation in the need to continue with this practice. The need to oppose the ruling comes not from a lack of concern for the women involved, but from trying to maintain the autonomy of the Muslim identity and practice - an unintentional reinforcement of the divides and desperate need for autonomy that arose in the colonial period. In recent years there have been many movements that have been working tirelessly to make sure that the practice is no longer legal in India. The Bharatiya Muslim Mahila Andolan (Indian Muslim Women Movement) has been very active in speaking out against the mistreatment of women through the issuance of triple talaq verdicts - men who have divorced their wives through messages, phone calls from different countries, and without much explanation. The movement was instrumental in drawing the issue out from the sidelines, and bringing to public attention, making it a point of public outcry. While triple talaq was only recently declared unconstitutional, the conversation to disavow it has been around for a long time. The current government, under Narendra Modi, is one that is Hindu-centric, and many members of the government have been using this issue to politicize and publically criticize Islamic practices. Tracing a socio-political idea to its root is very tricky, because there are always gaps, manipulations and interventions in how to came to be what is today. In the case of triple talaq, we see that its origin is rooted historically in the colonial period, its overhaul has been politically manipulated and portrayed in self-serving ways by the ruling party, and its implications and nuances are hazy to a public that does not know its history. The verdict that the Supreme court gave on August 22nd 2017 was not simply reflective of the demands of the Muslim women, but of the manipulations of the current government. The voice of the women who have realized their oppression and want to be respected played but a small role in the final verdict. They will continue to be sidelined in their own battles, as others pick up the cause and fight for reasons that adhere to, not subvert, the insidious patriarchy.